All prices accommodate 1 up to 4 shooters. We can take a max of 6 passengers per boat. Minimum trip is 3 hours. Multi-Boat trips available! No more than 2 shooters at one time for obvious safety reasons. 3 Hour trips are the most popular. If you book a 3-hour and decide while you’re out on the water that you would like to stay longer, that is always an option. Trip departure times vary from 9:00am to 4:00pm depending on availability. Bows, extra arrows, licenses, ice, and fish cleaning. 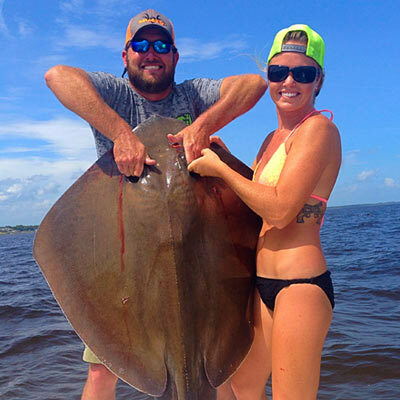 Daytime Fishing Only: Unlike most Bow Fishing trips elsewhere, here in Destin we do all of our Bow Fishing during daylight hours because it’s a lot easier to spot the fish from a long distance away. This makes it ideal for seeing big fish a long ways off and gives all hunters an awesome advantage to prepare for every shot. Daytime fishing also makes it much safer for beginners and kids! 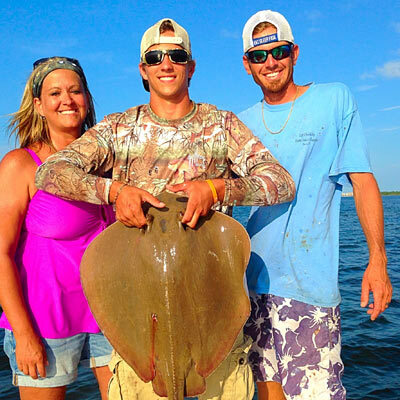 Location: Most of our Bow Fishing is done on the calm waters of the Choctawhatchee bay and surrounding waterways. Equipment: We use top of the line Bow Fishing equipment to optimize your chances to take that trophy fish of a lifetime. Our weapons of choice are PSE Wave compound bows, accompanied by AMS Pro bow fishing reels. If you have a bow fishing setup of your own, we definitely encourage you to bring it! Shooting something you are comfortable with only increases your odds. We discourage the use of speed line or fast-flight line. 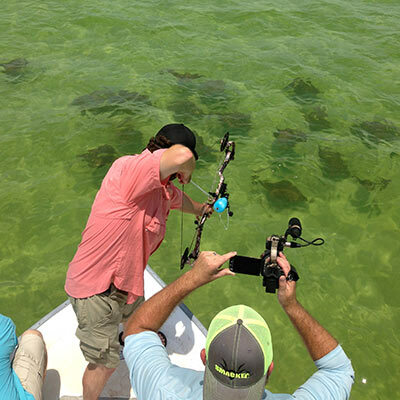 Since most all rays we shoot must be hand-lined in, due to size, the thinner line will cut your hand. Better safe then sorry! Age Limits: There is NO age limit. Please note that in order to penetrate a fish, a bow must be set on a minimum of 35lbs. Our bows are set no lower then 40lbs. If a child cannot pull the bow back on their own, a parent MAY NOT hold the bow for them. They must be able to operate the bow completely on their own for obvious safety reasons.